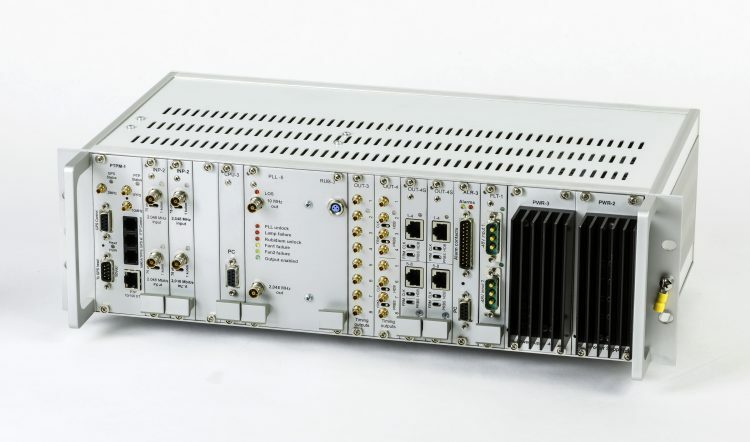 Thanks to its modularity PW1008 Synchronization Supply Unit is equally able to provide accurate timing signals for communication equipment of small, medium or large network nodes or telecommunications centers. In SSU mode the equipment is able to handle 8 different and independent incoming timing signals, one of them can be GPS source. The system equipped with internal Rubidium atomic reference makes it suitable for operating as Primary Reference Clock (ITU-T G.811) with excellent holdover performance and providing highly reliable and accurate synchronization outputs for up to 32 telecommunications equipment. For IEEE 1588v2 Grandmaster servers with SyncE and TDM (2 Mbps and 2 MHz) synchronization interfaces, also see our products PTPGM1009 and PTPGM1010.